Circular scale switch board instruments are available in four sizes (72x72, 96x96, 80x80, 130x130 mm). Designed to have wider deflection for higher accuracy & better readability. 1] Redefinement in ease & accuracy of reading. 2] High reliability in the design of 240° indication angle. 3] Ideal for use on switchboards & panels. Traditionally styled range of meter available in round (65 mm dia) & rectangular (106x84 mm) sizes. Strong body case manufactured from fully thermosetting phenolic plastic. five sizes (50x50, 69x58, 80x64, 80x80,106x84 mm). 1] Traditional construction with optically clear acrylic cover. 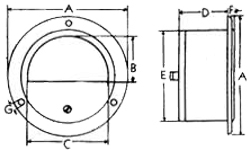 3] Self sheilded movement in SCF-50, SCF-69,SCF-80(R) models.